We are so excited to announce that Harvest Kitchen, The Royal Park Hotel, and eat catering have all joined on to Real Time Farms! They are all really fabulous businesses that are extremely dedicated to sourcing locally, so we’d like to briefly introduce you to each of them! Harvest Kitchen is a prepared food CSA (Community Supported Agriculture) program in Ann Arbor, MI. They offer meal packages year round, with options for both vegetarians and omnivores that might be too busy to cook, but want to be eating delicious and healthy locally-sourced meals. Harvest Kitchen recently received a grant from the U.S. Department of Agriculture through the the Farmers Market Promotion Program. This funding will allow them to expand their business, serving even more local customers and leaving them with full happy bellies every week! The Royal Park Hotel is a luxury hotel in Rochester, MI. Everything about The Royal Park Hotel is luxurious, top of the line, and elegant, including their catered events. They are committed to promoting sustainable agriculture by supporting and featuring regional farmers and artisanal producers, and they’d love to meet with you to create a seasonal menu for your special occasion. The Royal Park Hotel manages to making being very upscale and extremely progressive at the same time look easy! You’d never guess that they are devoted to composting, have charging stations for electric vehicles, and have earned Green Lodging Certification for their wide array of environmental initiatives. 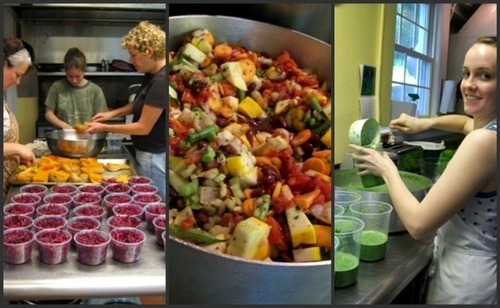 eat is based in Ann Arbor, MI, and they provide local catering and chef services. It’s hard to say anything about them better than they’ve already said it, so in their own words, “We want the food to not only be approachable, but flavorful and exciting. Food is inherently beautiful. We do not build ‘food creations’ or make dishes up, but allow carefully-sourced ingredients full expression within authentic food traditions. Locally sourced, traditionally-made food, prepared and served with attention to detail and care creates a sense of abundance and well-being that will make every eat event truly special and uniquely yours.” Downtown Home and Garden, a hundred-year-old shop in the heart of Ann Arbor, is going to begin inviting local food carts to sell food in their back alley and urban garden, and we’ve got the inside scoop that eat will be one of them! Many thanks to Harvest Kitchen, The Royal Park Hotel, and eat! We’re happy to have you on board as we continue to excite and educate people about where their food comes from and connect them to fresh, local sources of food. This entry was posted in At the Table (eateries) and tagged CSA, eat catering, harvest kitchen, lindsay jean hard, locally grown, locally sourced, prepared food CSA, Real Time Farms, the royal park hotel. Bookmark the permalink.